This full-length anthology of novellas and short fiction complements the Darkest Powers trilogy, adding new dimensions to the characters and their stories. Dangerous returns to Derek and Simon’s past and tells how they came to be at Lyle House. Divided continues Derek’s story, filling in his adventures with Simon while separated from Chloe. In Disenchanted, Tori takes center stage as she travels with Simon after Chloe and Derek go missing. Both Facing Facts and Belonging are set after the trilogy concludes. In Facing Facts, Chloe helps Tori deal with the truth about her parents. Derek faces family issues of his own in Belonging, when his werewolf clan comes to claim him. Please note: this is a repackaging of the stories originally released as Darkest Powers Bonus Pack 1 & Darkest Powers Bonus Pack 2. 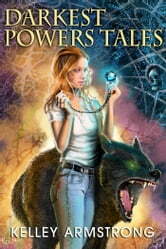 The book is a compilation of the 5 novellas in the Darkest Powers series. I found it to be great for finding out what happened in between when the group was split up. It was pretty much exactly what I was expecting. Its amazing and fills in spots that were left out of the books and it ends in a way that gives you a feeling of completement? I guess you'd say. Fills in some nice holes from the novels. Easy, enjoyable read. Good for those who have read the main series. The series of books that follow this are incredible! I wish I had read this one first before the others as I developed a love of the characters and it was hard to read this without getting a tad bored as I already knew little bits of it. But still a very good read! Such a talented writer! !